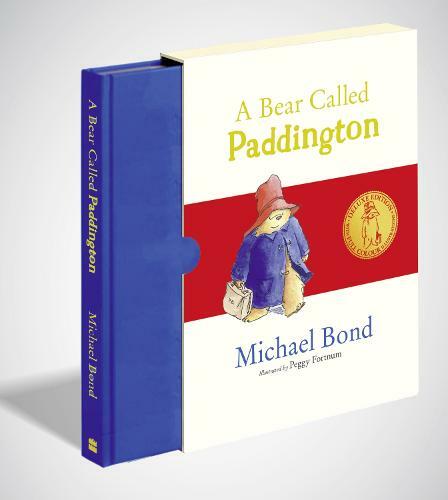 Unabridged and illustrated in glorious full-colour throughout, this exquisite slipcased gift edition of the original story of Paddington, the classic bear from Darkest Peru, is truly to be treasured! "A bear? On Paddington station?" Mrs Brown looked at her husband in amazement. "Don't be silly, Henry. There can't be!" Paddington Bear had travelled all the way from Darkest Peru when the Brown family first met him on Paddington station. Since then their lives have never been quite the same... for ordinary things become quite extraordinary when a bear called Paddington is involved. Sometime BBC cameraman Michael Bond was inspired by a last-remaining puppet bear on Selfridges shelf and memories of wartime evacuees to create possibly the most beloved character in children’s literature. Paddington debuted in 1958’s A Bear Called Paddington, returning in a number of stories that Bond continued to craft until his passing in 2017. A BBC animated series elevated Bond’s concept to almost cult-like status. Aside from Paddington, Bond also created two other series: Olga da Polga (kicking off with 1973’s The Tales Olga da Polga) and Monsieur Pamplemousse, a culinary mystery series for adults. The very sad departure of Mr Bond to the great library in the sky prompted my fondest memories of reading this as a child. This was bought as a birthday present for a long-standing Paddington fan. Birthday not for a couple of weeks yet, but am sure she will be delighted. It is beautifully presented and will no doubt be treasured!